Worth every penny! I love the luxurious feel of these pillows. They are an amazing value and look and feel like pillows that cost a lot more money! This Hotel Grand pillow is made with the most luxurious, high-quality materials available for production. The cotton cover is made of peerless white Egyptian cotton and filled with Siberian white goose down, one of the best possible ways to cushion and support your head while you catch up on your sleep. Dont bother with this item. Who knows what down it even is because its not Siberian. Its not medium and no way its 26oz of fill. I sent it right back its not as described. The pillow I've been using for what seems like a decade had seen better days, so I indulged myself with a new down pillow. Upon reading description after description I finally zeroed in on The One I had been looking for. Hotel Grand 1000 Thread Count Egyptian Cotton Siberian White Down Pillow read like the very one I had been in search of. I've had wonderful sleep and been without neck pain since I received my new down pillow. So glad I found The One for me! These were a bit too soft for a medium fill. I have always slept on real down pillows and have paid up to $300 each in the past. I bought these to replace older pillows that I have used for over 10 years. They have a nice fill so that they don't go too flat for a side sleeper but they also aren't as cuddly soft as my other pillows. OS has other pillows that are Siberian goose down with a removable cover for about half the price that I bought several years ago and paid about half the price that I think are a much better value and quality. I tried these because I was looking for something a little firmer and they do offer that but compared with my other ones, they just aren't as nice. Overall a good pillow just not great. This is my second pillow. The first one is now about 8 years old and has started to flatten down, but for several years it was too fat and I used it as a second pillow to lean against when sitting up in bed. Now it is my main pillow and can flatten out nicely while still having enough substance for support. I use this new pillow as a back rest to wear it in a little, although it doesn't seem to be as fat as the first one, and easier to flatten down and sleep on as well. I will keep buying this pillow as long as it is available. This down filled pillow is way too firm, I'm beginning to wonder what is in it, the sheets are a complete lie, said they are 1000tc, no way!! It would cost me so much to send this stuff back. I used to believe in overstock, but not anymore!! I only wish I had read the reviews, but didn't bease I used to buy a lot from them 4 yrs ago and so trusted them. They lost me for good now! 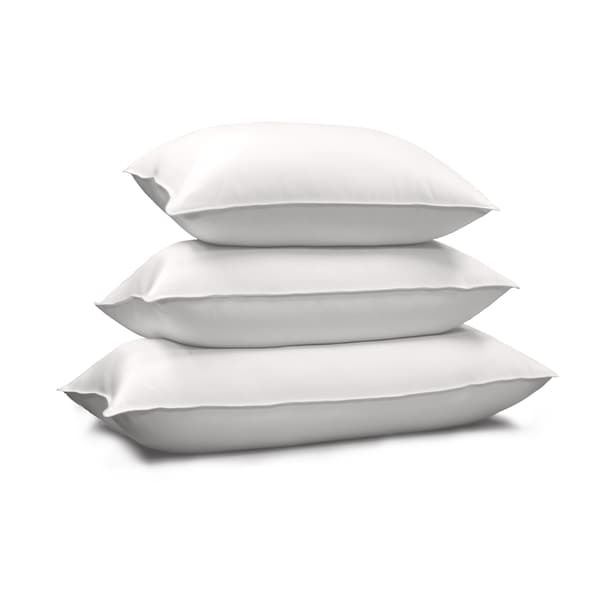 Have had many down pillows; this one is of very high quality and maintains its fluffy but supportive stature. Although you may think this item is expensive, let me tell you it is the BEST pillow I have ever used. It is soft but holds it's shape and does not flatten out when you put your head on it. Ideal for reading as well as the best sleep you can ask for! My only complaint; for the price, and considering the directions are "Dry Clean Only" it should come with a removable and washable cover. Always pleased with your products. This item is as expected. You can expect no leaking with this sturdy, well sewn covering. Pillow is supportive and what I expect from down. I love my down pillows. I waited for quite a while before writing my review to make sure this set stayed fluffy. My previous set of down pillows, a different brand, were luxurious at first, but began flattening inside of a year. These had a far greater loft than my previous pricey set, and they've maintained that loft through some pretty thorough usage (my cats also prefer sleeping on them). I've found them to be a very good value. Best pillow I have ever owned. But I do like being able to mold and shape to however I like. Very comfortable and forms perfect to how you sleep.. Liked these so much I bought another set for the guest bedroom. Good price for down pillows, delivery was right on time!! They are beautiful and go perfect! We got these pillows and am absolutely in love with them. I had almost forgotten what good down pillows felt like. I will probably be ordering more of them for my home and my semi. I purchased this pillow for my husband, who prefers a down pillow. He has found it very comfortable. My complaint about all down pillows is that the feathers seem to work their way out of the inside and through the outside fabric. To alleviate this issue, I simply place it inside two pillow cases or put a pillow cover on the pillow first. This pillow came very quickly, packaged efficiently with very little wrapping. The queen was medium firmness...I expected a little more with 40oz. down but the price couldn't be beat. I've bought pillows of similar quality on Overstock for $20-25 more so I think it's a pretty good deal. We'll have to see how it holds up over time. Yay a high-end pillow for a reasonable price. This item arrived in three days. I’ve had it for three years now and I’m still very pleased with the quality. I would recommend it to a friend. "is this 100% down or is it a mix of down and feathers"
Without actually ripping it open to see, I would say 100% down. Haven't had any feather pricks poking thru, which I have had with other pillows. Very happy with these pillows. 100% Down , I have three sets of these pillows on my bed, they're not like normal down pillows that go flat right away, they're medium density, do your head doesn't sink all the way through! I think they're the best pillow I've ever had. "What is the fill power on this pillow? Is it over 500?" Hello windyinok, the pillow has a 600 fill power. Have a great day! "So, is the pillow not made in the USA? The last question states that the label says China." Hello boxtop, this item is made in the USA. Thank you for shopping with us. "Your stating that the pillow is made in the USA, WHY THEN does the label say made in china, that's why I feel I received the wrong order?" Hello francesfs, you will be contacted by Customer Care. Have a great day. "Where is this pillow made?" Hello francesfs, this item is made in the USA. Thank you for shopping with us. "what is the fill power of this pillow?" Hello Pass Flora, thank you for shopping with us. The pillow has a 600 fill power. Have a great day. "Why doesn't it state on the label that it is 100% Goose Down? . It just says down and I feel that I was sent the wrong pillow"
Hello francesfs, the fill power is 600 with 25.6 ounces of fill for the standard, 30.4 ounces for the queen, and 36.8 ounces for the king size. Thanks for shopping with us! I am not asking for the "FILL POWER", I am asking why it doesn't say 100% GOOSE DOWN on the label, as stated in the description. I believe that this is a law that the fill had to be described? My questions are not being answered!